I have to thank my foodie-mate because if not for her, I wouldn't be able to discover this Chinese Restaurant. This is similar to Wai-ying in Binondo except that it is located in Banawe (think car parts and accessories). Also, it is was one the few resto in the area that's open before 8am. First photo is a very nice luscious-looking hakaw. This is good but I still think that Wai-ying's hakaw is better. It is still filling, though. 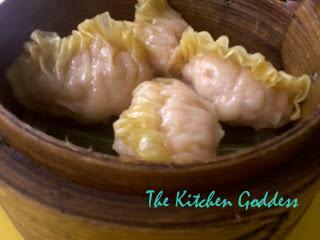 Sharksfin siomai. It's not really made from sharks fin so there's no animal-cruelty involved unless one is a vegetarian. 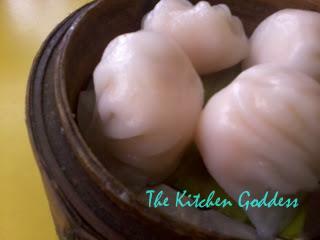 And this is G O O D and I am not really fond of siomai but this one is so so G O O D. See? G O O D.
Congee with century egg. Like siomai, congee is not something I will order unless someone forced me to. 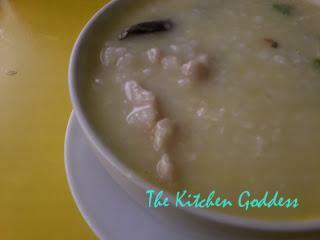 I usually associate congee with fever (visualize a sick child who can't swallow anything but congee/porridge). And surprise, surprise. I liked it. Very flavorful and filling. It warms not only the tummy but the heart as well. Brings back happy memories of childhood when warmth means being entwined in a parent's embrace.